The Cyprus Citizenship by Investment Programme does not regularly publish any formal reports on the number or nationality distribution of its applicants, nor about the sums invested, but it does share such information with Parliament at regular intervals, certain parts of which does, from time to time, trickle down to the public. As reporters in the investment migration industry, we rely on this steady drip of figures – a number here, a figure there – to estimate periodical statistics on the Cyprus CIP. According to the Cyprus News Agency, program officials informed the Cypriot Parliament last week that some 3,300 passports had been issued so far under the program. The last official figures, reported in April 2017 by the Ministry of Finance, stated that Cyprus had issued some 2,000 passports and raised in excess of EUR 4 billion through the CIP since it began in 2013. Looking at the arithmetic, the 2,000 passports must, in reality, mean 2,000 main applicants – and not individuals – because EUR 4 billion divided by 2,000 comes to exactly EUR 2 million, which is the minimum investment requirement. If the number 2,000 had included dependents, the total investment should have been far less than EUR 4 billion, as a single investment of EUR 2 million would suffice to qualify a whole family. Now that it’s been reported to Parliament that a total of 3,300 passports have been issued under the program, we presume this means that 3,300 applications have been approved because if 2,000 main applicants had been approved by April 2017, that must mean that the number of passports issued (including those to dependents) would have been around 6,000 already by last year. a) The number 2,000 reported last April must mean applications rather than passports because the revenue figure reported at the same time corresponded to the minimum investment required. b) Had the number 2,000 really meant passports and not main applicants, it would imply that the program had only single applicants, which we know not to be the case. c) Even if the average number of dependents in a Cyprus CIP application was just one (i.e. applicant plus spouse), the total number of passports issued under the program would have been 4,000 by April last year. d) The number 3,300 reported last week, therefore, also could not possibly represent the number of passports, but must represent the number of applications approved. 1.Cyprus has approved 1,300 applications under the program since April last year. 2.Total investment under the program since April 2017 has been approximately EUR 2.6 billion (1,300 x EUR 2 million), or about EUR 60 million a week. 3. This brings the total investment through the program since inception to some EUR 6.6 billion. 4. CIP-related investment in 2017 equated to 16% of Cyprus’ 2016 GDP. 5. 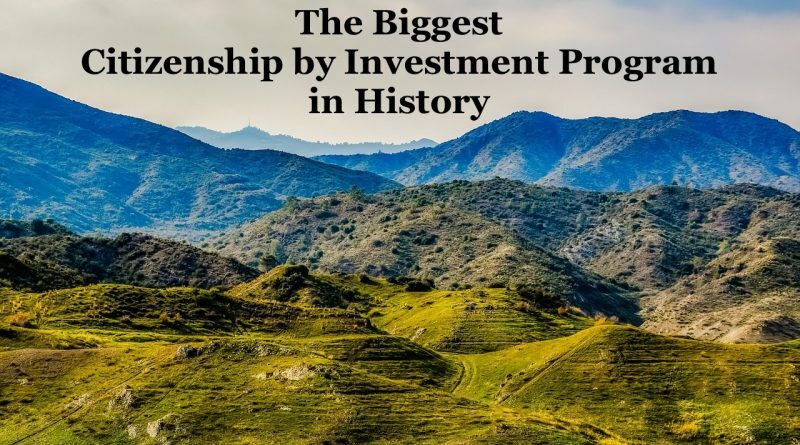 The Cyprus CIP, therefore, is the most lucrative CIP in history, and also the one that has naturalized the greatest number of investors. 6. The EUR 2.6 billion raised last year also imply that the program saw greater investment than all other CIPs in the world combined. Please be advised that these figures are estimates based on ad-hoc statements in Parliament and that any of the presumptions may rest on flawed information. Should any of our Grecophone readers have information to the contrary, we invite your input.